This image is based on a photograph I took this past November on the big island of Hawaii. I like it particularly because I took it at the time so deliberately. The light was amazing! To my left was a low dark black cloud and it was pouring rain. But UNDER that black cloud the sun was streaming across the sky to shine on this tree trunk. Before taking the shot I removed a stray gum wrapper from the base of the tree in the roots. I took my time before shooting it. I took only the one shot. I will say straight out that the original images has been extensively altered using photo-editting software, specifically Photoshop. That’s just what I do. 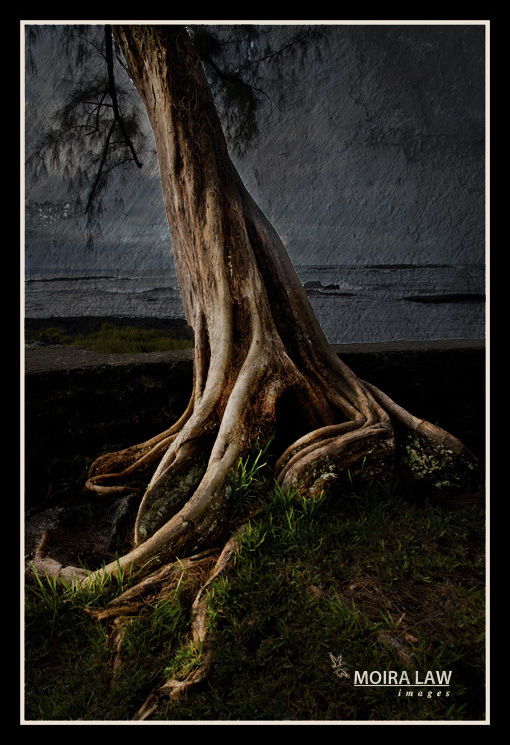 Posted in UncategorizedTagged art, Hawaii, photo editting software, photography, photoshop, shore, tree, tree trunkBookmark the permalink. This image is stunning, however you achieved it. That’s undeniable! it’s just like a beautiful sketching.